Mr. Mashburn began his federal career at the U.S. Census Bureau, where he worked on various projects focusing on the economy of the United States. He later transitioned to a management role at Census, where he led a team of programmers and analysts who collected, analyzed, and deployed data on federal spending. In 2009, shortly after President Obama was elected, Michael was selected to join a team of federal employees from various agencies who became responsible for the planning and implementation of the American Recovery and Reinvestment Act of 2009 (ARRA). The 2 major accomplishments for this team included a Federal Spending collection portal, where recipients of federal spending had to report on their uses of federal funds, and a subsequent public facing website where citizens could see where and how the ARRA funds were being used. 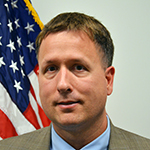 As the Director of Data Analytics for the Inspector General of the United States Postal Service, Mr. Mashburn is responsible for leading a team of diversified professionals, including GIS analysts, Data Scientists, and Project Managers. Programs from the Data Analytics area have led to significant monetary impact in both restitution and future costs, as well as efficiencies in processes.